razilian studio Casa 100 Architecture has packed a kitchen and a wardrobe into a thin alcove to make the most of space at a tiny apartment. 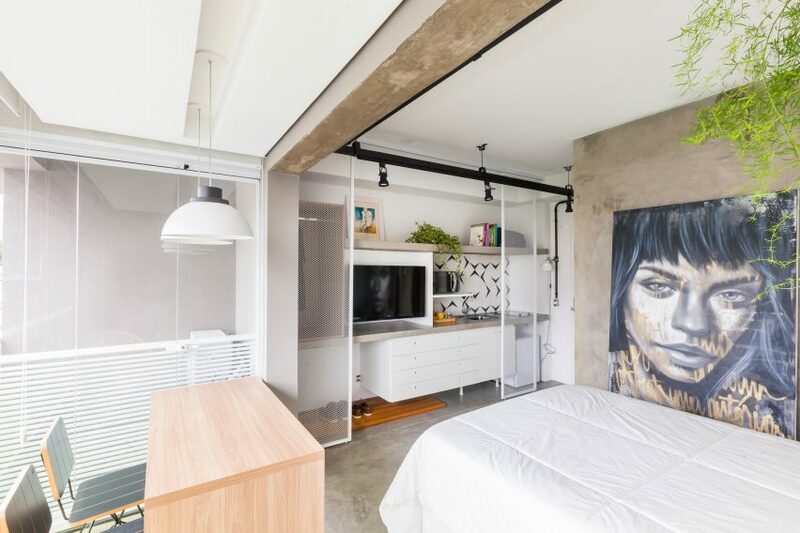 The local designer completed the Compact Apartment in São Paulo to provide the weekend home of a businessman, who spends his weekdays in Rio de Janeiro. Taking into account his short stays and few possessions, and with only 24 square metres to work with, the studio took cues from the simple and space-saving layouts of hotel bedrooms. The firm also chose a simple material palette, including white-painted walls to brighten the space and exposed concrete, with artwork and planting offering pops of colour. A combined kitchen and wardrobe are placed into an alcove to make extra room for the bed, study and small seating area in the remainder of the room. “The apartment is small, neutral, but with a studied project, and some multifunctional furniture, it fits the daily routine that the owner wished for,” said the studio. In the nook, a long concrete shelf forms the counter for the white kitchen island, and a support for hanging clothing below and a wooden cabinet built on top. Decorative items like books and art are arranged above on a second shelf. Other functions packed inside include the television, storage space for the resident’s suitcase, and a wooden block for shoes. Perforated white metal doors slide across to screen the area from the bed, desk and small seating area beside, which opens onto a terrace with a table for hosting four guests. The bathroom is housed in a concrete volume, where a large window filled with translucent glass allow light in. Pale grey tiles line the inside of the bathroom, following the simple hues found elsewhere. 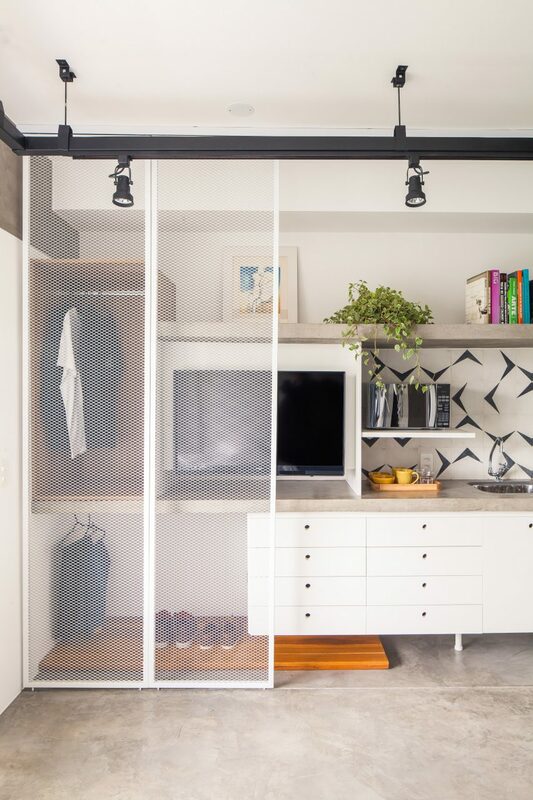 With cities becoming increasingly dense, Casa 100 Arquitetura is among a number of architects who have come up with space-saving designs for tiny residences. Other solutions have included a raised “sleeping box”, sliding furniture and following a Japanese method of organisation. Photography is by Andre Mortatti.